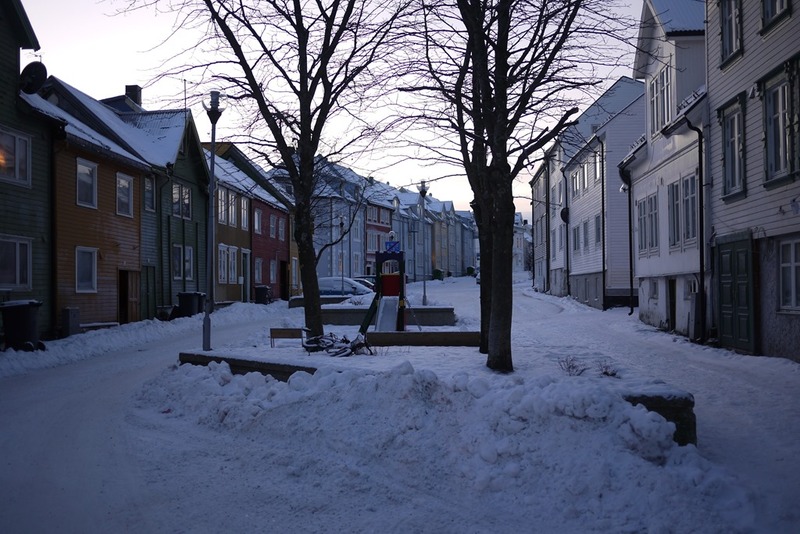 The crush of snow underfoot echoes in the deep winter of Tromsø. All other sounds sleep under a white, white blanket, waiting for the sun to rise in six weeks time. I am most intrigued by the pale sky. It fades between hues of blue and grey. That faraway sun, suspended below the horizon, would be too much to bare if I lived here, but at least the brightly painted houses punctuate the streets and hint at the living warmth within. My mission in Tromsø is the same mission held by so many other southern-dwellers who venture into the Arctic circle. I’m told not to get my hopes up, that the Northern Lights are mysterious and unpredictable, taunting travellers for days, leaving only the cold black night for their searching eyes. But mere hours have passed before I’m trudging through shin-deep snow, crunching in the empty night, up towards the hill-top cemetery , towards the hope of those eerie green dancers overhead. And sometime between the ice-dripping tombstone and the frosting wind and the fear that my toes will be bitten by sub-zero air, I look up to see silent green waves whisking and waving across a starry sky. How wonderful to see the northern lights. I’ve heard the same story of people being disappointed, so it seems you visited at just the right moment! Hi Mufidah – yes I was really lucky. It was a travel highlight for sure! I miss winter so much. I loved the novelty of winter, even though I’m a summer lover myself. Winter is so quiet and still. I love the silence of winter, the snow falling without a sound is so peaceful. Nice post. It can indeed be worthwile to venture into arctic circle and beyond in winter. For me, it was Finnish Rovaniemi where I was two week before christmas. There weren’t any northern lights, but the sunny day was fascinating. The morning red goes seamlessly into the evening red. There is no broad daylight and around 1.45 p.m., the sun sets. I was lucky that it was Finland instead of Sweden, where we went the day after. Finland is another time zone, one hour ahead of central european time. In Sweden it was our time and at around 2.45p.m. it was completely dark. ++++ Greetings from Frankfurt, Germany. Thanks for your comment and greetings from Brisbane, Australia. It’s a feeling that I’d love to experience again – that twilight-like day in a world of white. I also went to Sweden, but not that far north, although one night from Tromso, we drove in search of the Northern Lights and would have ended up in Sweden if it weren’t for a blizzard.